Our loving, caring staff works to provide a wide variety of age-appropriate activities and exciting learning experiences with the highest quality of supervision and care. The Kindergarten’s 3-5 year olds are eager students ready to learn and grow. They explore, discover, and absorb just about everything they encounter. 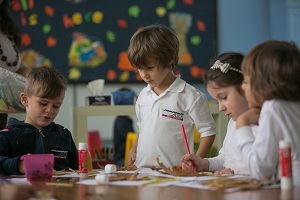 The Little Eagles Kindergarten Pre-school and Kindergarten promote the joy and curiosity our children have about their world, while providing an academic program that will prepare them for their transition to first grade.